Automated optical inspection, or AOI, is an advanced form of quality control and diagnostic technology available to WORLD electronics. AOI systems automatically inspect PCBs, scanning each one to detect any faults that can be discovered by visual inspection. These faults include missing components and component quality defects; for instance if the incorrect part has been attached to the board, or more commonly, that it sits at an incorrect angle which would prevent the board from operating correctly. Automated optical inspection is especially useful because it is a non-contact method of testing for faults. 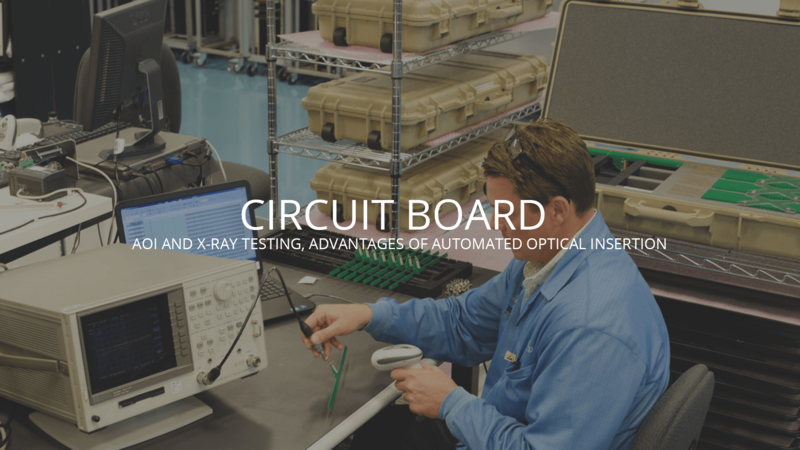 This minimizes the chance of damage to fully functioning PCBs through testing and allows for PCBs to be tested faster. The advantages of AOI are therefore passed on to the client through the faster and more efficient manufacturing process. AOI is used during production because of its speed and its comprehensiveness. WORLD electronics utilizes one of the fastest AOI systems available today; it’s able to keep up with the highest-capacity surface mount lines with a single AOI system. Our Teradyne AOI features a high-speed X-Y positioning platform, new image detection, acquisition architecture that completes the scan, diagnosis and board handling cycle, and greater than twice the speed of competing alternatives. Designed for heavy production environments, X-ray is used to inspect raw PCBs and assembled PCBs containing advanced components such as BGAs, uBGAs and Flip Chips. This versatile system features patented, award-winning X-ray camera technology that generates high-resolution, high-sensitivity images, revealing defects as small as 0.001 inches with a full one-inch diameter field of view. X-ray inspection is often paired with the electrical testing provided by ICT or functional test. It is an ideal low-cost solution for verifying prototypes as well as complex boards in volume production. Automated X-ray inspection is based on the same fundamental ideas as AOI, but as opposed to using normal visible light to inspect the outside of the PCB, X-ray inspection can find faults that would otherwise be hidden from view. The X-ray inspection machine produces images of the PCB which are then analyzed by image processing software, which can detect abnormalities and the presence or absence of features like components or wiring. This is especially important because it means that X-ray testing finds faults that AOI cannot. If implemented during the manufacturing process, this can save a significant amount of resources because it immediately prevents defective parts from wasting any further time during assembly. X-ray testing is useful not just during manufacturing, but during rework. As part of the standard reworking and repair process, WORLD engineers scan returned PCBs using the X-ray testing machine to efficiently determine the faulty connection or component causing the PCB to fail. This can normally be done quickly since the X-ray inspection machine can be geared either for low- to medium-volume production runs, or the inspection of just a few damaged PCBs. The reworking procedure is therefore kept as short as possible, far shorter than it would be where our engineers to rely on regular visual inspection.